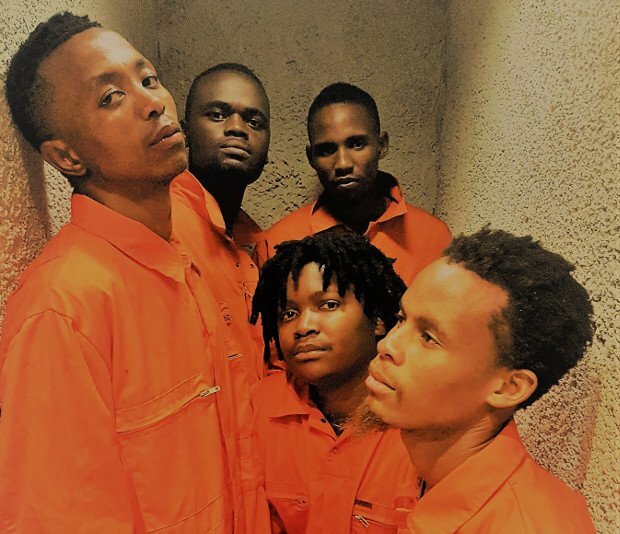 When the five prisoners of Cell Block Soweto enter in their orange jumpsuits, they are surrounded by the most basic of staging with a projected image of the inside of a cell setting the scene. This is inconsequential though because as the show unfolds, their light-hearted, cheeky anecdotes and buoyant songs prove that nothing else is required. The South African a capella show by After Freedom uses incarceration as a theme to interweave a number of songs with stories about escape, captivity and ill-fated love. Their opening medley of numbers, which includes Queen's 'I Want to Break Free', and Miley Cyrus' 'Wrecking Ball', is unexpected in its make-up but their stunning vocal harmonies mesh perfectly together, creating versions that are lush and original. Along with pop songs, they sing African tunes, adding energetic and perfectly in-sync step dancing routines to mimic instruments. A cappella can certainly be a hit or miss affair but here at Ghillie Dhu, Cell Block Soweto is proving to be an exception to this. The five performers deliver a show that is simple in its premise but executed with great flair, boundless energy and a sense of musical synergy, ultimately facilitating an uplifting experience that is truly good for the soul. Ghillie Dhu, until 23 Aug (not 18–20), times vary, £12 (£10). Also Bar Bados, 20, 25–27 Aug, 2pm. A cappella show from South Africa.